HAPPY MONDAY EVERYONE!!! Hope you have all had a great weekend in the snow. I have had a great weekend, it was my son's first encounter of snow and he loved it! Well done again to all those that attended my circuits class on Friday, you all worked hard as always. 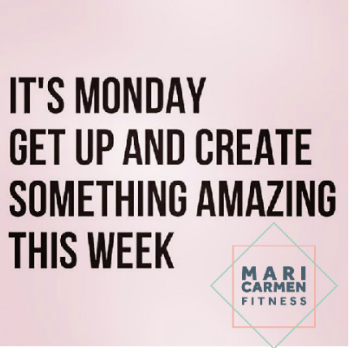 Look forward to seeing you all again on Friday for the last one before Christmas eeeek :) Don't forget to email me at hello@maricarmenfitness.com to book your place for the term starting January 5th 2018 at 6pm at St.Chads Centre, Bishops Tachbrook. So I imagine lots of you have many Christmas parties and social events going on over the next week. I know its the festive period but you will regret piling on all the pounds in January. What works for me is eating really well between these festive events and not making it a whole 'cheat' week of food. Just because you went out for a Christmas lunch with work doesn't mean that you need to starve yourself for the rest of the day to counter out the calories. Draw a line under it and make sure your next meal is 'clean' and 'balanced'. If you are not a fan of turkey swap it for chicken. The chick peas in it and turkey make it high in protein which will keep you feeling fuller for longer. Why not make lots so you can take the rest to work the next day to make a healthy lunch. Remember guys its all in the preparation, this way you will stay on track throughout the festivities whilst still enjoying yourself of course!! Fail to prepare, prepare to fail. ***SILVER PACKAGE*** 3 month plan of 1 personal training session per week plus FREE tailored nutrition plan. ***GOLD PACKAGE*** 3 months of 2 personal training sessions per week plus FREE tailored nutrition plan. ***PLATINUM*** 3 months of 2 personal training sessions per week AND 8 week circuits term AND tailored nutrition plan.